"Very accurate and easy to use tool. I would recommend it to any shop scheduler." 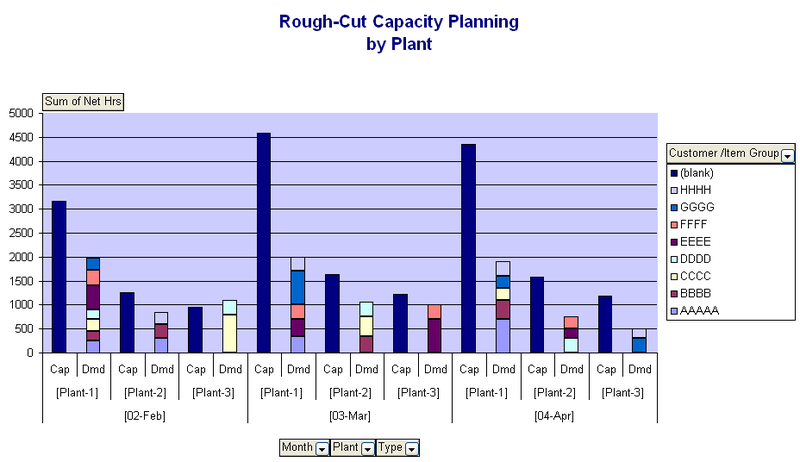 Rough Cut Capacity Planning (RCCP) Template help you to early involve in potential capacity issues and try to find any solutions to fix them before they happen! Easy to simulate and re-assign demand from overloaded resource to another one with graphical information. Using Pivot Table feature, we can have multi-dimensional charts such as chart by whole company, by plant, or by reource group. Depend on your manufacturing environment, but this Rough Cut Capacity template is developed using monthly basis with 3-month demand time fence. we recommend to select on only Bottleneck work centers to do it or may apply Theory of Constrains (TOC) to manage them. Step 1 - Define Resource Group Name. Step 2 - Define Plant Name. Step 3 - Define Month Name. Step 4 - Define number of working day and number of hours per day of each month. Step 5 - Define number of machine and % machine efficiency of each resource group in each month. Step 6 - Input demand and assign to the desired resource group. Four fields required are month, customer name or product group, resource to be assigned, net hour required. Step 7 - View four graphical information which comparing between capacity and demand of resources in 4 dimensions. Step 8 - If find that some resources have overloaded, we can reassign to other resource by go back to adust in Step 7, or if we can add overtime or improve machine efficiency or add more machines please go back to adjust them in Step 4 and Step 5. Step 9 - Enjoy your simulated capacity plan and print out to review with your boss.